NEW MILFORD — Residents strolling through the center of town around noon Saturday might have noticed a chorus of bells emanating from St. Xavier Francis parish. 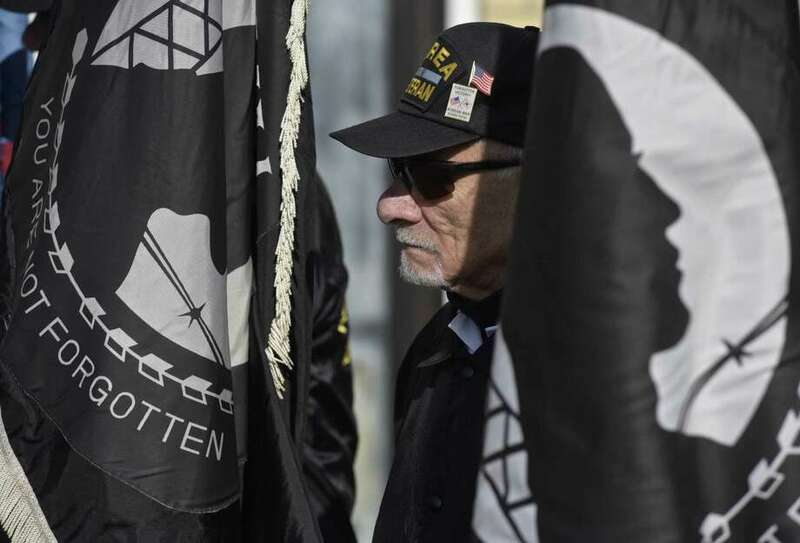 The church bells, followed by a quieter refrain of handbells, marked The Prisoner of War/Missing in Action Connecticut Forget-Me-Nots’ 33rd annual ceremony to remember the anniversary of the Paris peace accords, which ended the Vietnam War 44 years ago. Under this agreement, all prisoners of war were to be sent home within 90 days, but the New Milford-based group works to find those who have still not returned. Saadi said 25 soldiers from Connecticut are still unaccounted for from the Vietnam War, along with hundreds of others not recovered from World War II, the Korean War, Iraq War, Afghan War and the Cold War. The names of more than 100 unaccounted-for soldiers and about 15 whose remains have been found and returned were read at Saturday’s ceremony. The crowd of about 20 veterans and residents rang their handbells following each name. One name on the list was former New Milford resident Gerald Yarrish, a soldier killed in the Korean War. His cousin, Leona Tomascak, said honoring Yarrish was the reason she came to the event. Tomascak said she has been working with Kathy Shemely, the president of New Milford’s Forget Me Nots, to contact legislators about her cousin. U.S. Sen. Richard Blumenthal and Rep. Elizabeth Esty are helping her find information, Tomascak said. Other residents gathered Saturday said they don’t personally know a prisoner of war or missing soldier, but still wanted to show their support. Shemely also gave the crowd updates on cases in progress with government officials to recognize or obtain the remains of soldiers. She said the event is meant to raise awareness and honor even those families of soldiers who can’t make it to the ceremony. “The families need to know that their family members are important,” she said. The event was also attended by New Milford Mayor Pete Bass and state Sen. Michael McLachlan, R-24.